Wicked Hunting Lights™ is excited to announce the addition of the A47 Ambush Hunting Light with Scan & Kill® Technology. Successfully target hogs, coyotes, fox, bobcat, raccoon and varmints at night with the Wicked Hunting Lights™ A47 Ambush Hog & Predator Hunting Night Hunting Light. The A47 is purpose designed & built specifically for night hunting. 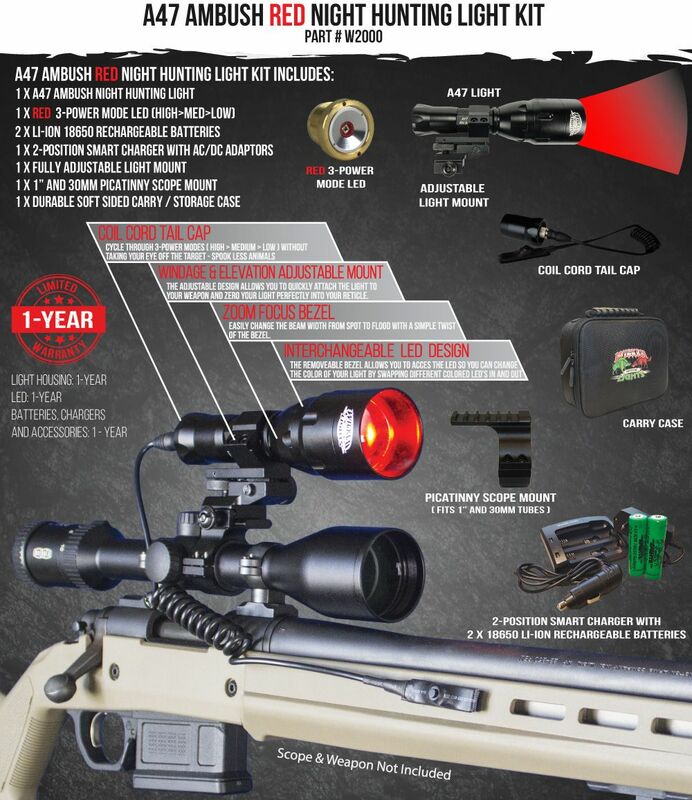 The A47 Ambush is not just adapted for use as with virtually all of the competitor lights. In fact a large percentage of "night hunting light companies" are using the exact same light known as a model number HS-802, or clone of it, and just having their name lasered onto the side of it. That's it, that's the extent of their research, development, field testing, design, prototyping, and effort in the development of their brand of night hunting night. In reality the HS-802 is an adequate utility flashlight, but it doesn’t hold a candle to a Wicked Hunting Lights A47 Ambush Light. Purpose built and designed for night hunting. Precision machined T6 Aircraft grade aluminum with type III hard anodization. Designed, serviced, and warrantied in the USA. Our second generation hunting light with Scan & Kill® Technology. Featuring a unique Zoom / Focus design which allows you to focus and or defuse the light beam. The A47 Ambush LED assembly is produced by an ISO9001 certified LED manufacturer for consistent color, reliability, and manufacturing quality. Operation temperature: Minus -30 ~ 120 degrees Fahrenheit. Battery type: Operates on 1 18650 PCB 3.7V Lithium-ion battery. A47 Bezel Diameter: 48.0 mm / 1.89 inches. A47 Body Diameter @ scope mount: 25.0 mm / 1.0 inch. A47 Weight one battery installed: 11.3 ounces. A47 Length: 178.0 mm / 7.0 Inches. A47 Length bezel extended to MAX zoom: 188.00 mm / 7.40 Inches. Warranty: Limited 1 year on light assembly, LED assembly, Battery and charger, tail caps, and all other accessories. See manual for details and limitations. The A47 comes with a Red 3-Power Mode LED. The LED assembly features a 1-year warranty and can be changed in the field in less than 20 seconds for those wishing to use or experiment with a diffident led color (uses Wicked Lights W402ZF 3-power mode LED's, additional LED's sold separate). The A47 LED assembly is produced by an ISO9001 certified LED manufacturer for consistent color, reliability, and manufacturing quality. The innovative combination of high magnification convex lens, specially designed LED circuit, and LED module that screws in to mount pad stop combine to eliminate the tedious and frustrating LED light focus adjustment procedure found in many of our competitors designs. No adjustment required - access and change the LED in 20 seconds. Weapon mounted light kits include picatinny style scope mount for use with 1 inch or 30mm tubes (also can be used to mount light on shotgun mag extension on many shotguns) and 1 fully adjustable light mount. **Ambient light (moon phase), scope quality & power setting, LED color, battery state of charge, background foliage, rain, snow, and size and color of target species will all affect range. ***Manufacturer specifications are subject to change without notice. Great quality with long range capability. Well built light, solid construction, useable visibilty to about 175 yards in correlation with your rifle scope. Lighter and better then the old wicked lights. Still don’t really like the new mount that has a windage and elevation adjustment like an M16A2 rear sight. Sits to far away from your rifle making the light feel twice as heavy as it is. I wish it had the old Nut mount instead of the finger right mount. Everything else is a great value. The mount needs some more engineering. Maybe a quick realease lever that can be set to the desired tightness instead of that Chinsy nut and a lower profile mount, the adjustability is great just needs to be more streamlined. I have 3 Wicket Light setups now and they are all awesome!!! Great and reliable products. I just purchased the A47 Red to go on my .243, I have the W402ZF Green on my 7mm-08, and the W400 Green with the Beam Shot on my 12 gauge. They get the job done. Also everything on the A47 and 402ZF are interchangeable and I love that. Now I have Red, Green, White, and Infrared bulbs I can use in either one. Can’t say enough good stuff about the products and the personnel at Wicked.